Established in 1988 we are a family run independent firm of estate agents headed by two very experienced owners and their professional team, chosen for their understanding of the local property market. We know from our own experiences how stressful buying and selling can sometimes become and our staff are trained to make your move as pleasant and trouble free as possible. Ashton & Perkins is run by dedicated property professionals committed to providing the highest possible level of service to our clients. Our reputation for honest, reliable advice and guidance to our many clients has been earnt over many years with a large number of clients returning to use our services time and again. 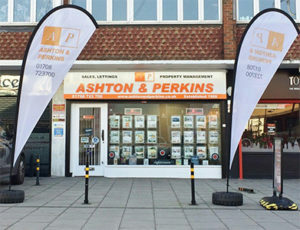 Clients can be assured that Ashton & Perkins Romford office is proud to be members of the National Association of Estate Agents (NAEA), The National Approved Lettings Scheme (NALS), The Tenants Deposit Scheme (TDS) and to the Ombudsman for Estate Agents Scheme (OAEA). Ashton & Perkins Ltd are members of the redress scheme, The Property Ombudsman Scheme and clients money protection scheme, TDS, the Tenancy Deposit Scheme.